I was born and raised in Melbourne, by Italian parents and lived in Norwich, UK for 17 years. I currently live in Castlemaine, Victoria. I am a literacy/literature activist, promoter and educator with over 20 years experience in reader/writer development. In 2011 I founded Write As Rain, which promotes and supports writing and reading in order to improve and enhance creativity, literacy, connectivity and well-being using a multi-artform and collaborative approach. My focus is on literacy, creativity, wellbeing and connectivity. 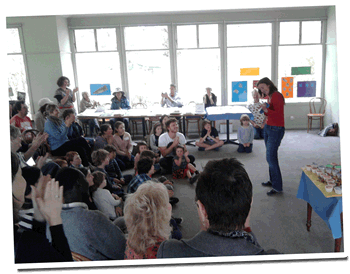 I am the founder/director of the Castlemaine Children’s Literature Festival The emphasis of the Festival is on the children themselves; as creative producers and active participants. My work is informed by issues raised by identity, misplacement, gender and domesticity. I have performed poetry on television and on national radio both in Australia and the UK; my work has appeared on trams, trolleys, internet magazines and beer mats. 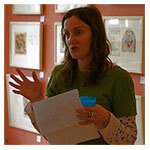 I have three chapbooks published and poems have appeared in magazines in the UK, Australia and USA. I have supported John Cooper Clarke and Benjamin Zephaniah, as well as reading at Glastonbury and other festivals. There’s been a few prizes along the way too. I’m very interested in creative writing with pre-school children and the connection between arts and health.